I began to feel the pressure from my neighbor across the street. They have a real Griswold’s Christmas light show happening over there. We are rarely home for Christmas. I don’t think we have been home for Christmas since we moved to Las Vegas. So, we never decorate. I don’t have many decorations. All we do is decorate a three-foot tall fake Christmas tree with one tiny string of lights until we leave for wherever we are off to. The destination is usually England or California. This year, we are staying home and our house if feeling a bit bare. You could imagine how non-festive our house feels with only this tiny tree, especially when I watched the wife and daughter neighbors climb huge ladders, walk across the roof, risking life and limb to string lights for over a week. The entire front of their house is lit. It’s quite the spectacle. Every square inch is wrapped in red or white lights. They have a lit up sleigh with Santa and reindeer out front too. Unfortunately, they decided to place the life size children carolers in the front window that look out directly to our house and really creep us out every year. Until last week, I still had a tiny pumpkin sitting in front of our house. That was my only Halloween decoration and I kept forgetting to remove it. Yesterday, we decided to head out to the store to find things to make our house a little more festive. First, I bought some pine smelling spray to make my little tree smell authentic. I bought a pine candle too. I thought maybe the spray wouldn’t linger long enough. Then, we found a wreath for the door. Next, we all decided on red bows to place around the yard and that was it. I know, no lights. Claud thought anything would pale in comparison to our well-illuminated neighbors across the way. So, we went with a red bows. It looks pretty. I think he actually just didn’t want to deal with stringing the lights. I didn’t mind and thought the bows were a good idea. Last night, my cousin came over for dinner. Before he arrived, I sprayed the tree with pine scent and lit the pine candle. I don’t think it made much of a difference because the food smell was so powerful. I was really in the mood for Mediterranean food. I made some homemade hummus with red peppers. I also had some baked chickpeas sprinkled with sea salt. We nibbled on these snacks while we cooked our dinner. I baked piedmont peppers because everyone always loves those. I served them with arugula, which I just sprinkled with sea salt and a drizzle of little balsamic over the top. This makes the best salad on the planet. 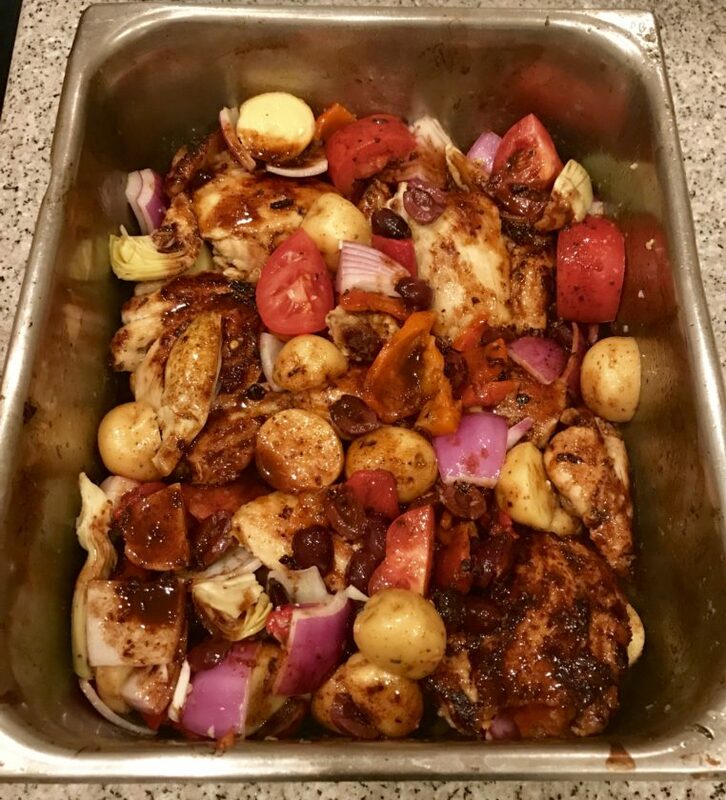 Claud and I made a baked Mediterranean chicken dish. I took the exact same ingredients, minus the chicken and potatoes, and made them in a separate pan to pour over angle hair pasta to serve to the vegetarians. The chicken dish was incredible. Claud marinated the chicken for hours before we cooked it. You don’t necessarily have to do this. We threw in everything Mediterranean we could think of: garlic, lemon, olives, roasted red peppers, capers, artichoke hearts, etc… By the time Alex walked in the door, and made fun of my wreath because it is off center, the house was consumed with the smell of garlic and lemon. It was beginning to feel a lot like Christmas. Oh, I also bought a plug in air freshener which makes the kitchen smell like I am making pumpkin cookies all of the time. I started thinking that this is just mean. I am giving the impression that cookies are baking when they aren’t. That’s a disappointment. So, today, I will actually make some cookies for my family. They are going to be really festive. Daphne and I are headed out to the store now for ingredients. Yes, Christmas is really in the air. Pat thighs dry with a paper towel. In a baking dish, combine the lemon juice, 2 tablespoons of the olive oil, vinegar, garlic, basil, oregano, parsley and salt. Pour half of this marinade into a small bowl to use later. Add chicken to the marinade in the dish and coat the chicken with the marinade. Heat oven to 400 degrees. Heat 1 tablespoon of olive oil in a skillet. Sear the chicken on both sides until golden brown. Arrange the vegetables around each chicken thigh. Drizzle on the remaining marinade. Cover skillet with foil and bake until potatoes are soft and chicken is completely cooked through. This should take about a half hour. Change the oven setting to broil for about 5 minutes to make the chicken and potatoes crispy. Top with olives and lemon slices.